This morning, it struck me how complacent I am that I have high-bandwidth broadband access almost everywhere I go, from the wired LAN in this Small-Office/Home-Office (SOHO) household, through the ADSL high-speed internet connection, over Wi-Fi and 3G, and in hotspot, transport, and hotel connectivity. It is disturbing when the 3G can’t deliver or I find a terribly-sluggish Wi-Fi connection in a supermarket! It wasn’t that long ago that connectivity was slow, hard to come by, and sometimes rather expensive. The great 1980s advances for me were to 1200 and 2400 baud modems with Hayes command sets and direct connections to the household telephone circuit. That provided regular connectivity by the time my main computers were Heathkit H89s and I had my first hard drive (5MB in a chassis that weighed 70 pounds). What made that so tolerable, and exciting, was the abandonment of requirements for special telephone protective devices, the use of ordinary telephone circuits, and the fact that all communication was basically text and downloads/uploads were small. This arrangement continued when I threw in my CP/M 80 towel and acquired a 1985-model Heath-Zenith PC/XT clone running MS-DOS and, ultimately, Windows 1.03 to 3.1, all on 8-bit hardware. I’m unsure about the actual span of the 1990s move to integrated or PC-card modems that brought the phone line right to the computer. I tended to be a late adopter of more-expensive connectivity arrangements. But the prospect of 56k bps through various compression, handshake, and cooperative telco arrangements became the norm. My first Intel Pentium systems all had built-in or add-in dial-up adapters. There was a little confusion before dial-up adapters all converged on the common standard for that speed. On reflection, that seems to have happened easier than the current situation with cellular phones and emergency communication systems. Meanwhile, it was still all dial-up for me and the household. We managed on-line time by having a second phone line that also served as a fax number. I remember having to commit minor surgery at the pre-wired phone jacks in my Sunnyvale, California, townhome to have the single outlets provide dual-line connectivity everywhere. Although low-end workgroup computing is almost synonymous with the introduction of Windows 3.1 in the early 90s, I did not entertain setting up a SOHO LAN until I was offered broad-band ADSL in a call from Qwest. In 2001 we had moved into a home in West Seattle that was about 1.5 short city blocks from the local switching office. Not only was I offered broadband, but I was told that the best-qualified circuit to use was the old solid-copper POTS line into the house, not the late-addition second-line circuit that was also present. Smiling, I went for it. 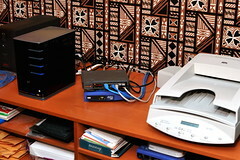 There were three computers to connect in order to share the ADSL connection. That inspired the move to a wired LAN hubbed on a residential router/gateway to DSL. Thus began the official Centrale SOHO LAN. As a side note, Wi-Fi was just being promoted as an alternative to wired LAN in households. I was having none of it at that time. All of the equipment being operated was pre-2000 vintage and there were no native Wi-Fi devices in the household. In When the Backup is the Failure, I had the ironic experience of it being the backup system that appeared to be weak link in my protection of the Centrale LAN from on-premise outages. On Monday, May 10, I quickly obtained another battery-backup unit and reconnected it to the network units, including the HP MediaSmart Server with its Windows Home Server system. 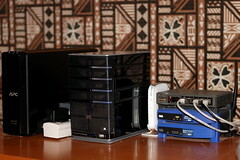 The network center is shown with the new battery backup, the WHS, my DSL modem, and the stack consisting of my residential gateway/router, a wireless access point, and a hub for aditional LAN connections. The idea is to have sustained power on the network so that connections of other computers to the LAN and from there to the Internet or the WHS can complete their operations and shut down in an orderly manner. The battery-backup indicates that, with the ordinary light load, there is enough power to sustain network and WHS operation for about 90 minutes. I don't know, at this point, how the other battery-backup failed. It was an older model and did not provide the visible indicators and self-test capabilities of its replacement. It may well have been on battery and the battery ran down without being noticed. That's an odd situation and I suspect that what I will end up doing is removing the batteries and taking them to the municipal disposal and recycling center. If not, I will have a battery-backup battery backup. As long as I was replenishing, I also picked up an addition 1 TB drive for the WHS and an external drive for backing up the folders of the WHS off-site. Those are my next projects for the LAN itself. At 21:30 last night I was watching the last episode of Law & Order: Criminal Intent Season 4. In the final minutes of the program, there as a high-pitched audible tone. I thought the audio from the Netflix Online viewing had gone crazy. But when the episode completed and I had closed my browser, the tone coninued. Then my computer reported that there was a missing LAN connection, assuming that my LAN was unplugged. So I'm thinking the scream is a failing hard drive and/or my main desktop computer is having a meltdown. I run around to the back of my setup and check the cables connecting the machine. The annoying shrill whistle is continuing though it varies a little and doesn't seem to be quite so loud. I figure rebooting might help, and I start that. As I lean back waiting for the reboot to take, I look over and notice that my stack of network devices is all dark. The router, hub, Wireless Access Point, and Broadband modem are all dark. Walking over for a closer look I see that my Windows Home Server is shut down and it is the battery-backup unit that I use for the WHS and network units is on "Overload" and that is the source of the high-pitched tone. I recycle the BBU and the network appears to be coming back up, I restart the Windows Home Server also. Then it happens again. I do some obvious things like test that plugs and connectors are seated, try the circuit breaker on the back of the BBU, but nothing works. I can move some wires and route power around the BBU, leaving it sitting there unconnected but still howling at me. The LAN comes up fine without the BBU. I finally got the refuse-to-die alarm to quiet by holding down the front-panel button for an extended time, then releasing it. It is sitting quietly dead, unconnected, at this point. I wonder whether the BBU had been on battery for some period of time and finally ran out of juice. Also, there had been some intermittent power hiccups several hours earlier in the day. I saw the desktop BBU click in and out, and the lights flickered in my office. I didn't hear anything from the LAN BBU, although I clearly don't even think about that one. It just sits quietly nearly out of sight, and I pay not attention to it. Until now. Meanwhile, I think I will get a replacement unit for this failing APC Back-UPS XS 900. Another XS 1300 may simply work better, although I don't think I need that much capacity. Then I'll see if this one will recharge (or not). All through this, it never occured to me that smoke alarms are similar. But none of mine sound like that, fortunately. This page is an archive of recent entries in the LAN category. conclave is the previous category. liberta is the next category.